The perception of self-agency in chimpzanzees(Pan troglodytes). The ability to distinguish actions and effects caused by oneself from events occurring in the external environment is a fundamental aspect of human cognition. Underlying such distinctions, self-monitoring processes are often assumed, in which predicted events accompanied by one's own volitional action are compared with actual events observed in the external environment. Although many studies have examined the absence or presence of a certain type of self-recognition (i.e. mirror self-recognition) in non-human animals, the underlying cognitive mechanisms remain unclear. Here, we provide, to our knowledge, the first behavioural evidence that chimpanzees can perform self/other distinction for external events on the basis of self-monitoring processes. Three chimpanzees were presented with two cursors on a computer display. One cursor was manipulated by a chimpanzee using a trackball, while the other displayed motion that had been produced previously by the same chimpanzee. 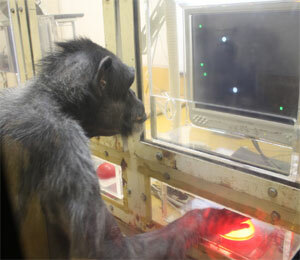 Chimpanzees successfully identified which cursor they were able to control. A follow-up experiment revealed that their performance could not be explained by simple associative responses. A further experiment with one chimpanzee showed that the monitoring process occurred in both temporal and spatial dimensions. These findings indicate that chimpanzees and humans share the fundamental cognitive processes underlying the sense of being an independent agent.